Seems like we have a lot of pit building going on right now so I thought I would start a tread that we can all add to and discuss what we have learned. Please feel free to add to, correct, or disagree with what gets posted here. The idea of this tread is to convey knowledge and opinions �� and everyone does have one! 1. Thicker steel does not mean a better cooking pit. Thicker steel takes longer to heat up and carries that residual heat over to recovery when the door has been open�.. however, once a thick steel pit cools, it does take longer to bring it back up to temp. 2. Insulated pits are harder to design and do cost more but in the long run they use less fuel to run and recover faster than non-insulated pits. They are normally made from thinner metal so longevity may (or may not) be a factor in high humidity areas. 3. While regular steel pits can be painted, repainted, and work great, stainless is perceived to be better. Because I currently own a larger stainless pit I will admit that there is a wow factor when you first see one. However���.. stainless is extremely expensive and difficult to work with. You cannot use tools used with regular steel on stainless because they will adulterate the metal at a molecular level and will allow rust to take hold on the stainless. Stainless also moves quite a bit when it is heated and before you know it, your door has sealed itself shut and won�t open until the unit cools. Stainless will also discolor when subjected to high heat. It is almost a patina process and can be brought back to a silver luster, but that involves a lot of scrubbing and or sanding. Finally, stainless fire door hinges will readily rust when subjected to high heat, other forms of mounting doors should be considered over these. 1. The longer the pit, the harder it is to maintain a even heat pattern across the entire length. Before I get into a discussion of plates and such, I feel it is important to remind new builders that it is airflow through a smoker that determines the effectiveness of the unit. Too little air flow will cause the heat to stay in the firebox while too much will cause the heat to escape out the exhaust before you can use it. Improper airflow will also cause temps to spike and fall during the cooking session and have caused many a backyard chef to ditch their cooker. Normally with a end mounted fire box you will have a hot end or zone and a less hot end/zone. The ways to reduce this temperature variation usually revolve around tuning plates or a reverse flow design just to name a few. 2. Standard Offset designs have a firebox at one end of the cooking chamber and an exhaust chimney at the other. Heat from the firebox enters the cooking chamber under a cooking rack on which the meat sits. The airflow from the firebox towards the exhaust stack is what cooks the meat. Add in the radiant heat from the surrounding walls and you have essentially an indirect oven in which smoke passes and slowly cooks the meat. While offsets are simple in design, a BBQ chef must learn the equipment they are using. Airflow through the cooking chamber, air intake, and exhaust setting must all be learned and adjusted in order for the chef to properly prepare for a long cook. It is this practice that can be exasperating to a non-seasoned chef and informative to those wanting to learn more about the craft of slow cooking. 3. In a Tuning Plate model the fire leaves the fire box and passes along a channel of multiple plates set above the bottom of the pit (but above the firebox exit into the pit. )These plates are also set below the cooking grate in the main section of the pit. The idea is that as the heat flows out of the firebox and into the channel it will heat the plates up and they will radiate heat into the cooking chamber. As the hot air (and smoke) travels out of the fire box into the channel, it also passes through the openings between the plates. By adjusting the gap between these movable plates, you can adjust the temperature zones. Small gaps cause the hot air to move further down the pit, while larger gaps allow the heat to escape in their immediate area. It is important to remember that limiting the number or size of the gaps will cause severe airflow problems in a smoker. You must extract as much heat from the hot air passing through the plates as possible without clogging up the whole system. As far as how much of a channel should you build is determined by the length of the cooking chamber, the shape of the same, (round bottom or square) and how big of a fire you want to build at the firebox end. I have had success with 4 inch channels on 6 foot smokers however, channels up to 8 inches should be considered on longer smokers. 4. While many builders focus is on the hot air and smoke, you should not forget that you are also dealing with radiant heat as well. As the air passes from the firebox to the exhaust it will be heating up the plates and the surrounding metal. The plates should of at least 13 gauge metal and be set approximately 6-10 inches from the bottom of the lower cooking grate. This will allow them to contribute to the cooking of the meats while also giving enough room to limit the heat from flare-ups generated by fat dripping onto a hot surface. If you are going to insulate any portion of a cooker, you should consider insulating the bottom of this channel first. This will allow you to redirect the heat coming down the channel upward (into the cooking section) and not out the bottom of the cooker where it does no good. One safety note though, the insulation in this section of the smoker must not be allowed to come into contact with the dripping fats from inside the cooker. If it is allowed to become saturated with fats and oil����� you will have a major fire when you least expect it. When I first built my stainless steel smoker, I did not insulate the bottom. I did however set it on some specialty build stainless tables that had pressure treated lumber supports. During the first long cook, I noticed that I had smoke coming out from under the table. I looked under the table to find the table top supports on fire from the radiant heat generated from the channel. Needless to say that I now have steel supports under the smoker now. 5. Reverse Flow smokers work similar to tuning plate models in so much as they also use a channel and radiant energy from a steel plate. The difference however begins with the number and length of the plate. 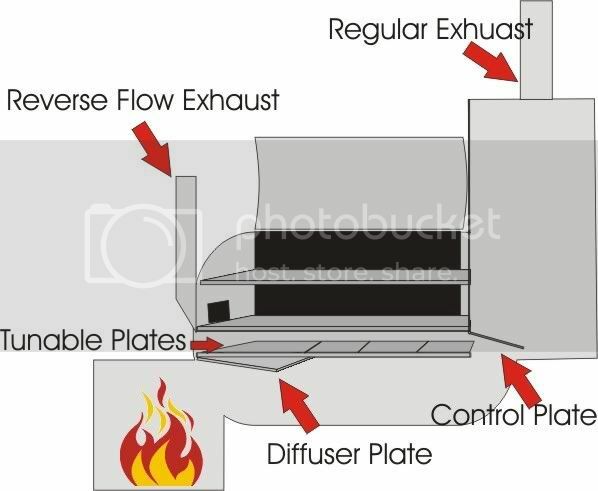 In a reverse flow smoker, there is normally only one plate and it securely fits up against the connecting wall of the firebox and cooking section. The other end of the plate though does not reach the far end of the cooking section and a gap of approximately 3-7 inches (depending on the length of the smoker)is at the end farthest from the firebox. Now you would think that the hot air leaving the firebox would travel down the channel to the end, enter the cooking chamber and exit through the exhaust. This would be true except for one factor. In reverse flow smokers, the exhaust is located back at the firebox end of the cooker. So now when the hot air and smoke enters the main cooking section, it has to travel back to the firebox end to exit the smoker. Like a standard offset design the draw from the chimney moves the hot air and smoke towards the exhaust and out of the smoker. However, radiant heat from the plate below adds to the amount of heat generated and a more even cooking zones are created. While a reverse flow plate is not adjustable, by raising and or lowering the tow tongue of the trailer, you can speed or slow the time it takes for the heat to move down the channel. This in turn will adjust the heat in the cooking section. While reverse flow cookers may seem to be the best, they are notorious for eating large amounts of wood to maintain temperatures. 6. Lately, a new design has been showing up and is gaining ground. Hybrid Cookers, utilize the best of all three of the cookers listed above and although more expensive, many chefs consider their adjustability to be well worth the added cost. In a hybrid cooker a control plate located at the end of a segmented reverse flow plate allows the chef to choose which style of cooker they want to use. 7. Vertical Smokers are another choice many novice and experienced chefs choose to cook on. In a vertical smoker the heat comes from the bottom of the cooker and is normally diffused by a diffuser plate or more commonly, a water pan. Meat is stacked rack upon rack in a vertical smoker and the temperature of the cooking chamber is controlled by air vents on top ( and bottom sometimes) of the unit and the amount or type of fuel used. While there are a great many different brand names of vertical smokers on the market, two models of vertical smokers have achieved recognition for their design and cooking abilities. The first model I mention is the best selling smoker in the world (according to them.) It is the Brinkman Smoke N Grill or more affectionately known as a �ECB� or (El Cheapo Brinkman.) This is a no frills smoker that cost approximately $30 U.S. and has been the reason for many backyard chefs to upgrade as soon as possible to a better smoker. The ECB is at best cantankerous and it is hard to maintain temps without modification. The second smoker has a more reliable reputation. In Fact, the Weber Smokey Mountain (WSM) is rebound as one of the very few �set it and forget it� smokers. By using the �Minion Method� (a method of arranging the unlit coals in a pile and placing a few burning ones in the center)WSM have been known to maintain their temps to over 4 hours without and fiddling with the smoker or adding fuel. All freestanding vertical smokers work somewhat the same way as shown below with the exception of verticals mounted to the end of a horizontal smoker. All are relatively efficient as far as fuel goes and can hold enough food to feed a small family or army depending their size. 8. As I have more time, I will add more info��� Don�t forget to add your own ideas as well! Great post Michael, it should be a sticky! Stainless pits are rare indeed for the reasons you mentioned. I have zero rust on my hinges (304 grade). I myself enjoy the fact that not once in almost 8 years have I had to scrape/sand rust or do any painting. That is a twice a year project with my Stumps, and everytime I do it's a great reminder of why I like stainless. You forgot to mention that it cleans easier too! I love mine but......... it was a bear to build. Hey Alien BBQ, Great post has a lot of great info. I don't have as much experience as you with cooking and building but did learn a few things building my first real offset. A plasma cutter would have made the job a lot easier or even a cutting torch. All I had was a grinder with a cutting wheel and a sawzall and a jig saw. Welding with a 220 arc welder does not work well with a 55 gal barrel the metal is just too thin. I am still learning my smoker but so far it is working great. Which a lot of help came from here just reading different post and some questions. Great Post! This is a great example of why many come here to Ring. The tool chest is always open. Hey Alien, since you seem to be the master at smoker builds, Can one get the reverse flow plate in an offset smoker to close to the cooking surface? Would 5" or 8" be better in your opinion? I have a 500 gal lp. tank that is 36" dia x 10' long. My question is, using your 3:1 ratio, I need to be about 12" off the bottom of the tank to get the ratio right, that leaves me about 5-6" clearance between the reverse flow plate and the cooking surface. Is that enough clearance or what would you recommend? I cant find my scratch pad with all the dimensions I had on it right at the moment. But I know with your ratios and the size firbox I had in mind I need to be about 12" off the bottom of the tank, sorry about all the questions, but with the cost of steel these days, I sure would like to get it right the first time without to much experimenting. Thanks in advance. Great post mike I'm sure it will be helpful to many pit builders out there. 1. Read as many postings here on the Smoke Ring and anywhere else you can to get ideas before you start. 2. Ask questions of anyone that you think might be able to help with ideas. 3. Once you think you have it all down go ahead and start. Just be prepared to design on the fly. Sometimes things just don't go the way you think they will. 4. Have fun with the project! Can I get an order of fat, dipped in fat, wrapped with fat with some fat on the side? Would be nice after this has been up awile to take all the informative posts and put them together and sticky it. What ive learned the most woulde be when cutting out doors leave the corners attached about an inch each way and about every foot or so leave about an inch uncut then let it cool completely then use a sawzall or something similar to finish opening it without heating it back up to so it doesn't warp then remove the door and tack weld a brace in a few spots on the inside so the door wont open up when welding flat strap to the outside of it, you still want to go slow and spot weld it. Ive also learned not to get into a rush, take your time and do your homework and never completely weld a piece on till your 100% sure it's gonna work the way you want it too. Oh NO I cant believe she took your tools, that just wrong. Alien - nice post, very informative and well written. the graphics compliment the narrative. I slightly disagree with the 1st point "Thicker steel does not mean a better cooking pit." MY OPINION: the thickness of the steel used in offset cookers drives quality and longevity. I know it is possible to build a poor quality cooker from 1/4" or 3/8 steel, but in general guys using 1/4" or better are aiming for something that will last a lifetime and can maintain temps needed for long / low cooks. It is one of the reasons all of the top builders choose to differentiate themselves by talking about the thickness of the steel they use to build cookers. Again - just my opinion. I am not trying to take anything away from your very good post. I see your point and agree with you for the most part. What I was trying to get across is that a good design is a joy to cook on. If you can get a great design and thick steel then have it made in the shade. Unfortunately some pit designers (not all) are still stuck with cut open a propane tank and slap some pipes on it and call it a smoker. While I have a really thick trailer mounted pit made out of a well casing, I have found that being able to work and bend and fabricate steel makes for more choices to the pit designer. When you toss in a stainless liner or insulation then you have a smoker that may not last as long but can hold a temp in the rain or doesn�t take 5 tons of wood to get it hot in sub freezing weather. Alien BBQ , I want to thank you for the info you have made available to everyone on this forum. I read all of your posts and anything else I could find on the web and on this forum. The info here on the Smoke Ring was tops. Using the information enabled me to build a smoker that worked !! Thanks Again !! Gentlemen I am really enjoying reading all your info. I am living up here in Canada and have just started to learn how to smoke ribs on my weber. Now i am going to buld an offset smoker. Money being the major issue. [3 boys in univ] I have decided on an offset cooker 20 dia by 44 long Fire box 17x17x18 with a 4.5 x10 opening. My question is how far off the bottom of my cooking chamber do i place the tuning plates and do i mount the chimney under the lowest grill [roughly 10 inches] or just above it. any ideas on the damper for this opening [the 4.5 x 10] and how close to the bottom of the chamber do i place this opening] Just trying to get it aqll straight in my heas before i start. This information is priceless to say the least... great post indeed. One thing I found out to be very important on a smoker is its heat radiating factor, less is better and that requires a good design and plenty of insulation for good efficiencythus long, temp. controlled burns. Life's too short to drink bad wine! Well i couldnt stand it anymore so i started build today. I am a tin wacker so i have use of 16 gauge and other metals . I am making a insulated fire box. The outside with a inch flange facing in with a half inch lip in also. Now i will drop a 10 gauge box inside of that with a one inch space all around box. I figured the 16 gauge wouldnt be enough so i am lining it thus insulated. Now can anyone show me any ideas of fire box doors and damper ideas also what kind of damper would be used on opening from fire box to cooking chamber. Thanx i am underway yahoo. Will post some pics soon. Everyone i have welded up the outside of my fire box 20x20x20 and was wondering after looking at so many smokers would it be wise for me to cut out the top and add a door for grilling or would it lose too much heat.